Yellowhead is committed to supporting First Nations ability to organize and mobilize to protect their rights. To this end, we have created these downloadable resources, which are meant to be accessible tools that accompany our research and publications. This presentation and accompanying user guide provides an overview of the report, Canada’s Emerging Indigenous Rights Framework: A Critical Analysis. It includes key takeaways and a high-level overview of the report’s three sections on relationship reform, policy reform, and legislative reform. ⟶ Download the presentation here. ⟶ Download the user guide here. This is a visual model illustrating the process by which historic treaty and Indian Act bands could be ushered through the Rights Framework. ⟶ Download a PDF here. 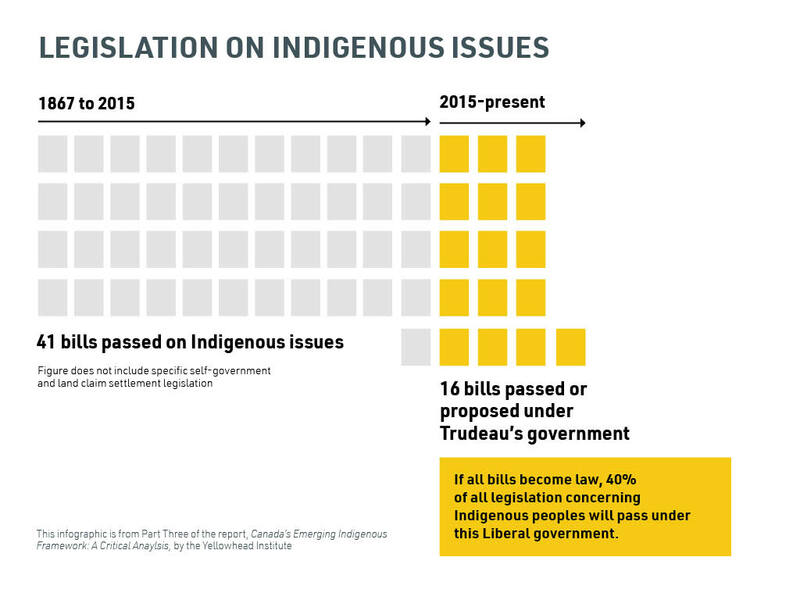 This infographic illustrates just how active the current parliament is when it comes to legislative changes impacting Indigenous peoples. This timeline shows a short history of seminal moments that exemplify how the Canadian government has actively avoided responsibility to First Nations from 1947 to present day. This infographic shows 2016 Census numbers related to Indian status and First Nation ancestry, projections for Indian status eligibility under Bill S-3 and statistics around First Nations membership control vs. their ability to determine Indian status. This infographic shows statistics representing the impacts of systemic racism in how Correction Canada assesses and makes decisions about Indigenous peoples.